Scribe Scribe of Egerton 1991 and Oxford, Corpus Christi College, MSS 67 and 198. Decoration Large initial in colours and gold with a full foliate bar border (f. 1). 26 large initials in colours and gold with three-sided foliate bar borders at the beginning of each tale (ff. 12v, 42v, 52v, 57v, 58, 59, 72, 89, 97v, 103, 108v, 117, 133, 149, 162, 171v, 181v, 185v, 187v, 194, 200v, 207, 227, 238, 247v, 252). Smaller 'champ' initials in colours and gold with ivy tendrils extending into the margin. Small initials and paraphs in blue with red penwork decoration or in gold with dark blue/black penwork. Running titles in black or red in some sections (e.g. ff. 13-28, 86v-148v, 156v-196v, 213-220v). Titles in display capitals. Collation Gatherings mostly of 8, with evidence of quire signatures in the lower right corner of the rectos in the first half of the gatherings (see f. 20) and framed horizontal catchwords in the lower right corner of the last verso of each gathering. Binding BM/BL in-house. 19th-century binding of blind-tooled brown leather over (original?) wooden boards; gilt edges. Provenance Written by the scribe of the 'Canterbury Tales' in Oxford, Corpus Christi College, MS 198, and of Gower's 'Confessio amantis' in Egerton 1991 and Oxford, Corpus Christi College, MS 67, among other manuscripts (see Doyle and Parkes 1978; Backhouse 1987). The initial and full bar border on f. 1 were probably executed by the same anonymous artist who worked on Rennes, Bibl. Municipale, MS 22, ff. 32, 76v, 89 and 105, and Royal 2 B VIII (see Scott 1996). 16th-century additions of marginal titles and running titles in cursive hand, passim, and the drawing of a vase in brown ink (f. 180). The Brunstone or Brunston family of Preston by Faversham, related to Lady Anne Grey, late 15th century: inscribed with the names of John Brunstone, William Brunstone and Thomas Brunstone (f. 286v; see Manly and Rickert 1940; Wright 1972). Henry Sidney, 16th century: inscribed with his name (f. 170). Anne Grey, in 1556: inscribed 'My lady Grayes Boke' (f. 169), 'Anne Barlet' (f. 187), 'Anne Grey wife to the Lord John Grey and Dowghtor to Wyll[ia]m Barlee Esquier owith this book' with date and initials 'E. W.', identified as those of Edward Waterhous (f. 286v; see Wright 1972). Elizabeth Kympton, in 1557: inscribed with her name (f. 129), and with date together with the names of Edward Waterhous and John Brograve (ff. 61, 81, 187; see Manly and Rickert 1940; Wright 1972). Edward Waterhous or Waterhouse, in 1557: inscribed with his name and those of Anne Grey (f. 187) and Elizabeth Kympton (ff. 61, 81, 187), and with his initials (f. 286v; see Wright 1972).
? Anne Leu[enthorp ? ], 16th century: inscribed with her name (f. 147). Thomas Leuenthorp, husband to Dorothy, grand-daughter of Lady Anne Grey's brother, in 1564: inscribed with sayings and texts in Latin followed by his name (f. 285v), and with his name and date (ff. 286, 286v; see Manly and Rickert 1940; Wright 1972). Sir John Brograve the Elder (bap. 1538, d. 1613), lawyer, before 1602: obtained from Thomas Leuenthorp and inscribed with his name and those of his sons, including Charles who died in 1602 (f. 286v; see Manly and Rickert 1940; Wright 1972). Simeon Brograve (d. 1639), eldest son of John's Brograve, and his wife Dorothie, née Leuenthorp: inscribed with their names (f. 286v; see Wright 1972). Other inscriptions include 'John Martant', 16th century (ff. 144, 180), and 'John Thomsyn' and 'John Thomsun Symond, late 16th-early 17th century (ff. 165v, 284v). John Somers, 1st baron Somers (b. 1651, d. 1716), lawyer and politician, c. 1701: his pressmark 'H.9' (ff. [iv], 1); no. 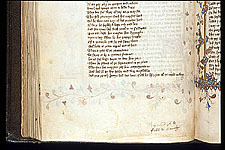 2 in the catalogue of his manuscripts, now Harley 7191, f. 153; bequeathed to his brother-in-law, Sir Joseph Jekyll (see Wright 1972). Sir Joseph Jekyll (bap. 1662, d. 1738), lawyer and politician, brother-in-law to Lord Somers, after 1716: inherited from his brother-in-law as part of the Somer's library (see Wright 1972). The Harley Collection, formed by Robert Harley (b. 1661, d. 1724), 1st earl of Oxford and Mortimer, politician, and Edward Harley (b. 1689, d. 1741), 2nd earl of Oxford and Mortimer, book collector and patron of the arts: acquired by Edward in 1738 and inscribed 'Dec. 1738. Oxford B. H.' (f. 1). The tales are in an order which is unique to this manuscript, they lack some headings and running titles, and some of their variant readings presuppose the work of a good editor (see Doyle and Parkes 1978). The manuscript includes the Tale of Gamelyn at the end of the incomplete Cook's Tale (ff. 59-70), preceded by a scribal (?) note in cursive hand reading (f. 58) 'Icy commencera le fable de Gamelyn' ('Here will begin Gamelyn's tale'). Select bibliography A Catalogue of the Harleian Manuscripts in the British Museum, 4 vols (London: Eyre and Strahan, 1808-12), III (1808), no. 7334. 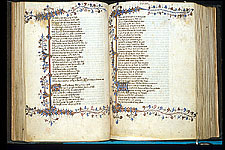 The Text of the Canterbury Tales Studied on the Basis of All Known Manuscripts, ed. by John M. Manly and Edith Rickert, 8 vols (Chicago: University of Chicago Press, 1940), I, pp. 212-13, 225-26. Cyril Ernest Wright, Fontes Harleiani: A Study of the Sources of the Harleian Collection of Manuscripts in the British Museum (London: British Museum, 1972), pp. 83, 85, 171, 177, 204, 213, 223, 309, 349, 474. Giovanni Boccaccio: Catalogue of an Exhibition held in the Reference Division of the British Library 3 October to 31 December 1975 (London: British Museum Publications, 1975), no. 36 [exhibition catalogue]. A. Ian Doyle and Malcolm B. Parkes, 'The Production of Copies of the Canterbury Tales and the Confessio Amantis in the Early Fifteenth Century', in Medieval Scribes, Manuscripts & Libraries: Essays Presented to N. R. Ker, ed. by Malcolm B. Parkes and Andrew G. Watson (London: Scholar Press, 1978), pp. 163-210 (pp. 177, 192-94). Alex I. Jones, 'Ms Harley 7334 and the construction of the Canterbury Tales', English Language Notes, 23 (1985), 9-15. Hilton Kelliher and Sally Brown, English Literary Manuscripts (London: British Library, 1986), p. 10, pl. 5. Janet Backhouse in The Age of Chivalry: Art in Plantagenet England 1200-1400, ed. by Jonathan Alexander and Paul Binski (London: Royal Academy of Arts, 1987), pp. 521-22, no. 719 [exhibition catalogue]. Kathleen L. Scott, Later Gothic Manuscripts 1390-1490, A Survey of Manuscripts Illuminated in the British Isles, 6, 2 vols (London: Harvey Miller, 1996), II, p. 133. Treasures of the British Library, ed. by Nicolas Barker and others (London: British Library, 2005), p. 56.